About a week ago, I ordered a shock mount for my brand-new microphone through Guitar Center’s website. Shortly after I received my shock mount, Guitar Center sent me a follow-up email, and I was SHOCKED. You see, most brick-and-mortar stores just don’t get it. They ask for emails, and then they blast those emails with untargeted ads for every product except the one the person is interested in buying. Not Guitar Center. Their email marketing follow-up sequence was amazing, and today I’ll tell you all about it. First, let’s start with what we know. I bought a shock mount, which means I’m mildly interested in creating high quality audio. Right? So what’s a good product to pitch me next? Take a few seconds and think about it. As you can see, they sent me information for a few things. First, they invited me to come into their store for some free overview training classes. I just bought some audio equipment, and they follow up with some free training options. Does that make me want to go back to Guitar Center? Yep! While I believe the tech tips could have been better, with links to more in-depth articles, it was a nice touch. All of the tips and products were targeted directly to me. Would I open Guitar Center emails in the future? Why was Guitar Center’s email so effective? Their email was highly targeted. I just bought audio equipment, and then they sent me more information about audio training. More important, the email was laced with highly-targeted deals AND information—the best of both worlds. When you’re running a brick and mortar store, your main goal is to get people into your store. The more time they spend there, the more money they spend. So, if you look at the email, the whole point of the email is to get you back into their store for a free class. Their follow-up email is perfectly aligned with their goals. 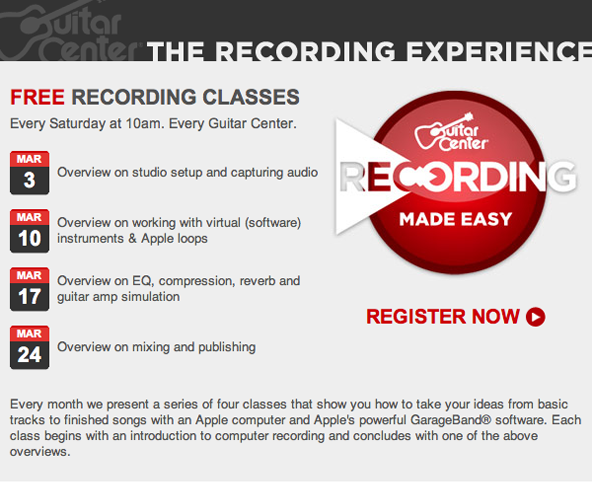 Now that I walked you through how Guitar Center works part of their email campaign, let’s talk about what you can learn from it. This might sound obvious, but there are loads of companies that do not follow up with their customers. That’s a huge mistake. When people buy products from you, they WANT to hear from you. They already proved it by giving you their money. Then, there are companies who do follow up with their customers, BUT they do it ALL wrong. For example, some companies, after receiving your email, will begin sending you promotions for anything and everything. They don’t send you what they think you want, they send you what they want to sell you. That’s a huge mistake. One of the reasons why I love the “what are you struggling with question,” is because it helps me understand what people want when they subscribe to my list. That way, I can sell people what they want…not what I want to sell them. Look, everyone knows that the best time to sell people another product is when they just bought a different product from you. When people are hot to buy, they’re hot to buy. However, if you just shill products, people get sick of it. That’s why you’ve got to mix it up with content and pitch, just like Guitar Center. Or, as another example, here at DIYthemes, after you purchase Thesis, you have the opportunity to subscribe to the blog to get more valuable updates about Thesis, email marketing, WordPress SEO, and other things that help you build a better website. Do we pitch Thesis here on the blog? Of course we do. DIYthemes is a business, and Thesis is the main product. As we begin to roll out other products, we’ll share information about them, too. There are loads of people who claim email marketing is dead. But they’re only half right. Email marketing isn’t dead. Bad email marketing is dead. Smart email marketing, on the other hand, is alive and kicking.